Today is my last day with the Rosetta as tomorrow it’s time to swap decks. What gifts will I be given this year? I can’t believe I pulled the same two cards! The message in these two cards leaves me feeling warm and fuzzy. What a wonderful combination for a gift – abundance and the seeds of success. A perfect end to my time with this deck. 🙂 I think I will be using this one a lot in the coming year. Oracle-X gave me cliff, dreams and chessboard. The chessboard is actually an extra card I ordered. Each Oracle-X pack has 30 cards which are the same in each but the last 6 are a random selection so each pack has a different combination. Extra cards can be ordered from the creators if you wish to supplement the ones you’ve got. I chose to get the chessboard card because it spoke to me strongly of strategy, playing a winning game, thinking carefully about your moves. In this combination, I can see a choice of options. In the middle are my dreams which I want to realise. The cliff represents the position I find myself in – do I take the leap of faith? The chessboard represents the more careful, considered approach. Is there a way of combining the two and taking a calculated risk? The Ace of Disks represents something tangible which is starting to manifest. It can be the seed of future success and wealth. The Three of Cups reinforces this message of well-being. It signifies a time of joy and gives a feeling of plenty. I take this message to be that the seeds of future abundance are being sown. However, I need to remember to enjoy that feeling of plenty when it arrives. Both cards also hint at fertility so there is further layer of meaning there. 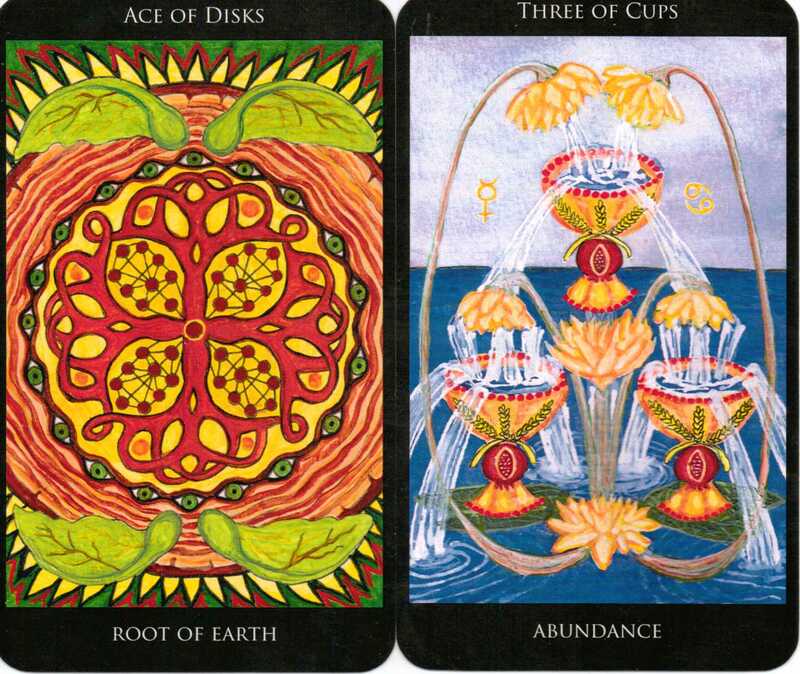 This would also fit with creativity – the Ace represents the seed of a project which leads to the well-being in the Three of Cups. Oracle-X today gives me health, river and lover. 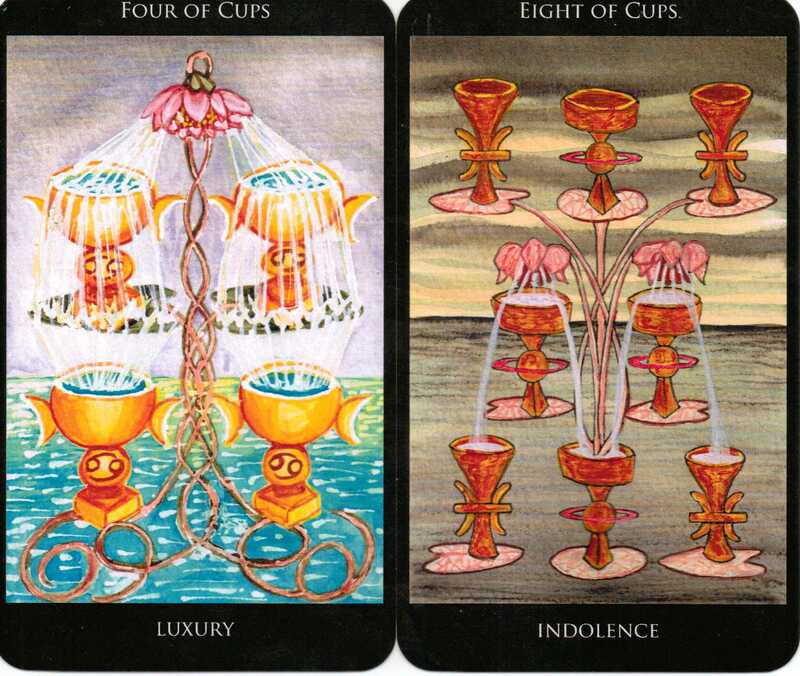 I can see a rather unconventional message, especially making a link to the Rosetta Three of Cups which shows ‘the waters of conception’. It seems to relate to reproductive health – the bee and the flower on the lover card bring to mind fertilisation. I’m taking medication at the moment – perhaps I need to check what effect it is having. Today I’ve got the Princess of Disks which was always my favourite card in the Thoth deck. She represents the lowest of the low in the Qabalistic tree of life and is capable of regenerating to the highest high. This card is a positive affirmation of the potential that exists within us all to make the very best of things. This fool is much more dynamic than the Thoth fool, stepping forward fearlessly. He represents new beginnings, initiation and taking risks. He is the leap of faith I need to get me from the Princess of Disks to the heights I seek. I can expect the unexpected as I step through into the void. 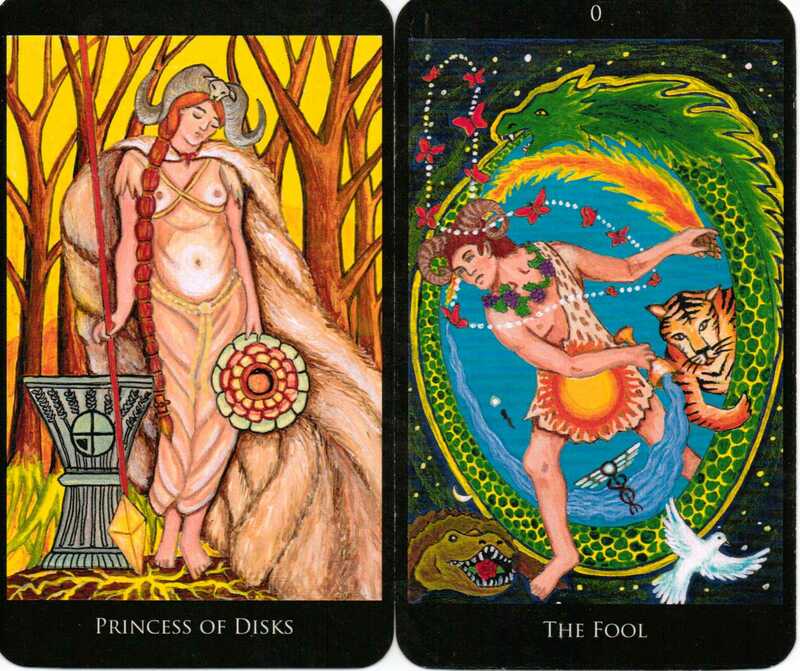 The two cards together remind me of what I want to achieve next year and give counsel me to be bold. With the Oracle-X I pulled Nest, Partner and Crowd. Here I can see very clearly my conflict for today. It is the last day that my husband and I have together before he goes back to work tomorrow. What I’d really like to do is just spend time relaxing at home but we have some household things to sort out so will have to go and face the crowds. For the next week I will be using the Rosetta Tarot. This deck was self-published last year by M.M.Meleen and is Thoth inspired. This card represents a moment of pleasure and stability but like all the fours, this moment cannot last – soon it will tip into the instability of the fives. The message here is to enjoy my current situation. I take this to be referring to my holiday. I’m getting to the stage where I’m dreading the return to work and this card is telling me to let that go and enjoy the time I have left. This card is a caution not to waste the time I have by losing all motivation and becoming lazy. It is a reminder of the goals I have set myself for next year which won’t be reached if I allow myself to feel resigned to my fate and let things become stagnant and stale. I combined the Rosetta with a 3 card draw from my Oracle-X. For today, I got labyrinth, newspaper and signal. These three together suggest to me that today I might feel a bit lost, like I’m moving further away from my goals. The labyrinth reminds me that all paths lead to the centre. The newspaper makes me think of written communication where I will learn something new while the signal will tell me whether I can go or if I need to stop.